This entry was posted in social media and tagged brands, liking brands, recommendations, social media by marc meyer. Bookmark the permalink. I think this is kind of a cynical view of that data. If you give any customer the chance to say they want coupons or special offers online, they are going to say yes (who wouldn’t?). That doesn’t mean their loyalty is tied to getting coupons or offers though. The phrase ‘loyal as long as you give me free stuff’ is not a definition of loyalty at all. It’s perhaps the opposite. Loyal customers want coupons, sure, but if they are really loyal, they’re not using the lack of free stuff to blackmail you with. You don’t want those kind of customers, they’re probably not worth much. All this data says is that coupons are popular. It’s not really a testament to the relationship between recommendations and loyalty. I read a forum thread about buying fans. Why would anyone do that? and why would they want someone to “like” them if they are just being bought to be a number on a page. I prefer to interact with my fans and…gee I don’t know, is it crazy to want them to interact with me? I prefer fans who want to be there because they find the content interesting, enough to tell a friend or share the content with others. And please don’t get me started on the “you like me and I’ll like you” craze. Again I ask; why? @Chiro There is an underlying aspect of Quid Pro Quo in social. Just look at the recommendations aspect of Linkedin. @Paul, What is the definition of loyalty in today’s world then? What does that really mean? 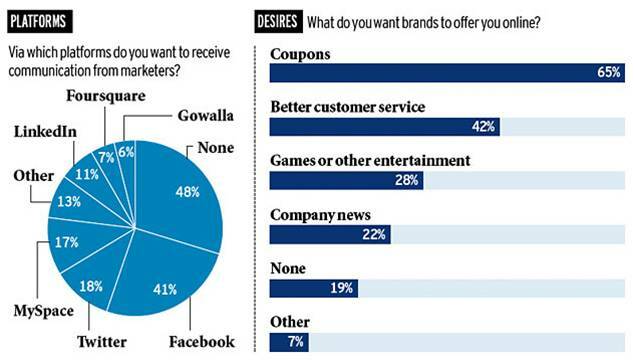 This is an interesting thought that we as consumers simply want coupons from brands online. I do not have data or insight to refute this notion, but I have to think that we all want some nugget from brands online. Given this, the easiest piece is a coupon since better customer service is hard to quantify and takes time + effort from the customer to get, which is fine with some and just another sore spot for others. Alas, it would be interesting, albeit difficult, to find out how many of the respondents (or people in general) who say they want coupons, are asking for coupons to brands they are loyal to. Or to know if these people have loyalty to any brands and what consumers want from brands to which they are loyal. In the end though, your thoughts are interesting ones that certainly raise questions about people’s motives with connecting with brands online. @Todd The bottom line is that we don’t follow brands for the quality of the conversation. We’re loyal up to a point but would like to get something out of the relationship.